Hefty and ready to haul heaps of coursework, HP's Pavilion revision makes for a compelling value that carries the household name well. When you think of the quintessential college computer, HP's Pavilion line has to be one of the first that comes to mind. The firm's PCs and laptops have powered students' careers for over 20 years right alongside those pink iMacs that found their way into a scene in every '90s teen show. And, like clockwork, HP is ready to take the kids back to school with its Pavilion lineup of affordable multimedia notebooks. Your everymachine for every task, if you will. Naturally, HP has gone and upgraded its leading learning laptops with stronger components while making them thinner and lighter than before. And, one to always exercise a flair for style, HP has tried something new with its laptops' looks. Now, don't mistake here: you won't find aluminum finish and obscenely small measurements here. These laptops are designed to perform well for a low price and maybe even show off a little. The $579 (about £394, AU$753) Pavilion 15 (also available in 14 and 17-inch varieties) comes encased in a smooth plastic shell that's available in several colors. Naturally, HP has cute names for these colors: Natural Silver, Modern Gold, Dragonfly Blue, Cardinal Red, Sport Purple, Blizzard White and Onyx Black. The one touch of (almost) metal on this laptop is a pair of chrome-covered hinges that support the screen well. Beyond that, it's plastic for days. In a way, that works in the laptop's favor, considering all of the components it can house inside make for just up to 4.62 pounds (starting at 4.26 pounds) of weight and up to 24.5mm (starting at 22.5mm) of thickness. You'll definitely feel this machine in your backpack, but I've definitely put up with worse, especially for what you're getting. Let's start with what you're looking at: a bright (if a little too blue) HD display. Color accuracy doesn't appear to be this display's strongest suit, but it'll be just fine for coursework and the odd Netflix binge. In this case, "HD" means 1,366 x 768 resolution, with FHD (1,920 x 1,080) and 4K (3,840 x 2,160) IPS options available. By the way, those Netflix binges will get a hearty help from some top-firing speakers tuned by Bang & Olufsen. 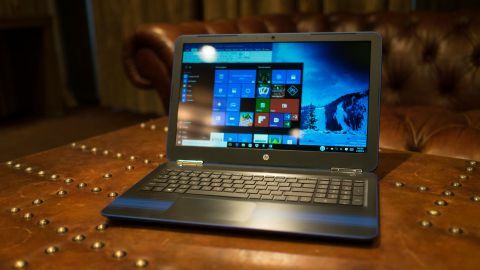 While HP has been decidedly mum on the specifics, the Pavilion 15 comes packing up to a 512GB solid-state drive and 2TB of spinning drive storage. That's backed by as much as 16GB of memory and an Intel Core i-series processor (up to i7, 6th generation). HP pegs the Pavilion 15 for 9 hours and 30 minutes of battery life, though judging from every battery test I've ever run, I seriously doubt that's the case in real-world use. It's good on HP then for shoring up that loss with its Fast Charge tech that can charge its laptops to 90% capacity in just 90 minutes. On the connectivity front, all new Pavilion models come packing at least one HDMI port, two USB 3 ports, one USB 2 port, an SD card reader and an audio combo jack. Finally, you can swap the stock webcam out for an Intel RealSense camera, which enables Windows Hello secure login through face recognition. As for the using the laptop, its keyboard is unsurprisingly not backlit, but worse offers what felt like rather squishy travel from chiclet-style keys that are a little too square for my liking. Given the Z-axis height available here, surely something could be done to make for a punchier set of keys. That said, they're spaced well, and I don't anticipate the keyboard presenting anything more than a learning curve. The smooth plastic trackpad isn't anything stellar, but isn't anything outright awful either. Through and through, this is a cash-strapped college student's laptop. The Pavilion 15 offers the power that the average student needs but at a price tag that the average student may afford. When you look at the HP Pavilion 15 like that, it's almost as if folks are better off heading here before the primo PC aisle, flush with a few more bucks of book (beer) money. While it's a bit heavy and the keyboard isn't the best I've ever laid fingers on, this looks to be a solid workhorse that, if treated right, could last a kid through all of undergraduate study if not longer. (Trust me, I had a Pavilion carry me through college.) For under 600 bucks, there's not much more you can ask for.